Summer is synonymous with many things: baseball, fireworks and, unfortunately, mosquitoes, which can ruin a summer barbecue faster than a rotten hamburger. But they can also transmit serious diseases including West Nile virus and malaria, and can expose dogs to heartworm. 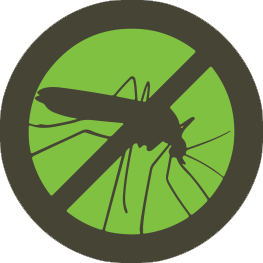 A September 2012 report by the World Health Organization and Environmental Protection Agency estimates that 300 million people worldwide are infected with mosquito-borne illnesses each year. The good news is, you don’t have to run for cover every time the sun goes down. With a little preventive maintenance and monitoring, you can gain the upper hand and achieve a mosquito-free yard. The No. 1 thing you can do to reduce mosquitoes is to eliminate standing water. Mosquitoes go through four stages in their life cycle: egg, larvae, pupa and adult. All but the last stage occur in water. Without water, mosquitoes can’t reproduce. After a mosquito eats a blood meal, leaving the human with an itchy bump caused by an allergic reaction to the insect’s saliva, it searches for water to lay eggs. The EPA says it takes about two weeks for an adult mosquito to emerge. Mosquitoes aren’t as similar to vampires as you might think. Only females bite, and for a specific reason. You might think your yard is safe from mosquitoes because there’s no obvious sign of standing water, but the reality is that even a bottle cap full of water can become a mosquito breeding ground. “Clogged gutters or gutters that don’t drain properly are common breeding sites,” says Rick Yates, in Wilmington, Delaware. Frost says mosquitoes breed when the temperature is consistently above 50 degrees. “Once the mosquitoes start to hatch, there is a new crop of mosquitoes every seven to 10 days until we get the first hard freeze,” he says. Depending on the region of the country, the first hard freeze may not come until late October or November. Check out this infographic with 9 tips for keeping mosquitoes at bay.